10mm (hole to hole) x 12mm (wide) "3-petal" flowers. Clear beads with fuchsia or violet synthetic coating, and then a bit of silver color sprayed lightly on part of each bead. The coating on Czech coated beads is fairly thin, and I don't know how durable it is (although I expect that it should last for years, but not necessarily for decades). 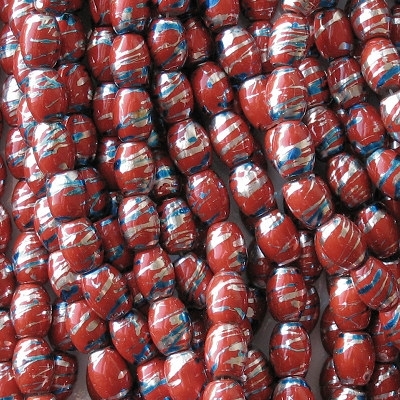 The newest Czech synthetic coatings are quite hard and feel like glass. 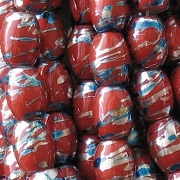 The second batch of these beads is more purple and less red than the first batch, and also darker than the first batch. The new batch, in my opinion, is much nicer; the color is deeper and richer and more pleasing. 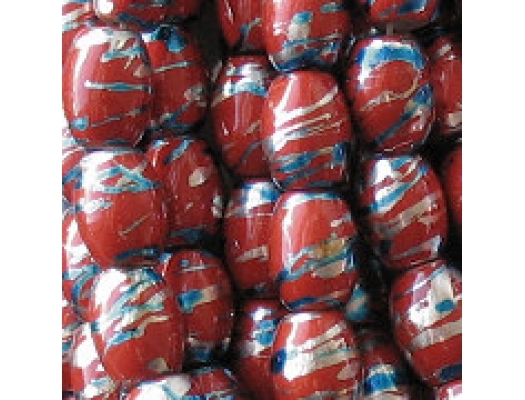 Usually when a style of beads changes from one batch to another, it gets worse; but that hasn't happened in this case. Instead of re-photographing the new beads, I used my photo-editing program to darken the picture and shift the shade towards purple. Surprisingly, my modifications came out very well.